Quinoa is a pseudocereal that contains high quality protein, minerals, vitamins, polyphenols, and phytosterols. In this study, quinoa was fermented by Rhizopus oligosporus (R. oligosporus) up to 5 days and the functional compounds (l-carnitine, GABA, vanillic acid and gallic acid) were analyzed by LC/MS. The amounts of l-carnitine and GABA were 0.13 mg/kg and 540 mg/kg for nonfermented quinoa (NF), 3.15 mg/kg and 1040 mg/kg for fermented quinoa at 3 days (3F), and 1.54 mg/kg and 810 mg/kg for fermented quinoa at 5 days (5F). The vanillic acid and gallic acid were 1.3 and 0.1 mg/kg for NF, 1.55 and 2.37 mg/kg for 3F, and 1.83 and 0.84 mg/kg for 5F, respectively. Total phenolic contents and total flavonoids contents were 41 mg gallic acid (GAE)/kg and 13 mg quercetin equivalent (QE)/kg for NF, 74 mg GAE/kg and 16 mg QE/kg for 3F, and 80 mg GAE/kg and 19 mg QE/kg for 5F, respectively. Antioxidant activity (SC50) was 3.6 mg/mL for NF, 3.4 mg/mL for 3F, and 2.3 mg/mL for 5F. 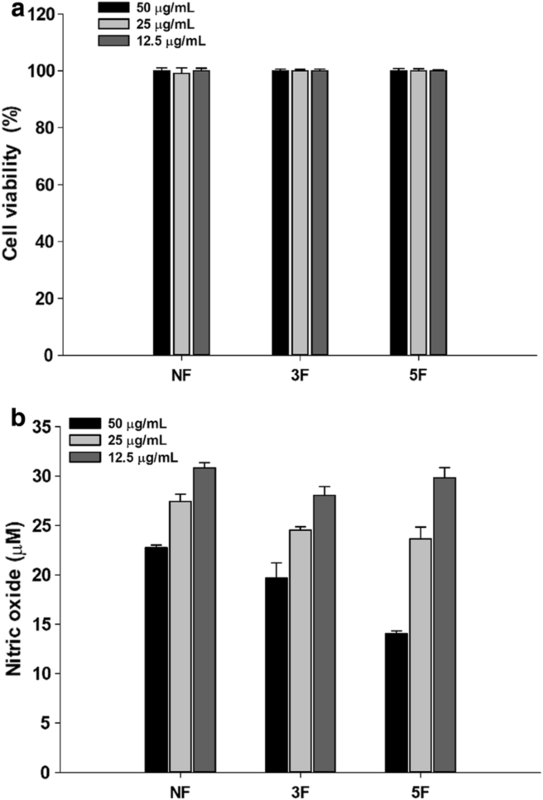 Nitric oxide production on RAW264.7 macrophages of fermented quinoa revealed 29% and 56% inhibition of nitric oxide production for NF and 5F, respectively. Therefore, fermented quinoa can be used as a healthy and valuable food product. Quinoa (Chenopodium quinoa) has been widely cultivated in South America for 5000–7000 years (Vega-Gálvez et al. 2010). It has high nutritional properties and contents of antioxidant compounds; essential amino acids, vitamins, minerals, and unsaturated fatty acids (Carciochi et al. 2016). Lysine and methionine contents are high in quinoa, deficient in many legumes and rice, and also can be a precursor of l-carnitine synthesis (Koeth et al. 2013). l-carnitine is synthesized from lysine and methionine, serving an essential function in transportation of fatty acids into the mitochondrial compartment for β-oxidation and subsequent energy production (Bremer 1983). l-carnitine is abundant in red meat (5977 mg/kg beef) but in lesser amounts in crops (0.4 mg/kg wheat seed), and plants (2.9 mg/kg tomatoes, 0.8 mg/kg avocado) (Steiber et al. 2004). In addition, l-carnitine is an antioxidant compound that can prevent oxidative stress and regulates cellular respiration by nitric oxide (Brown 1999). As an antioxidant role of l-carnitine, mainly three enzymes (glutathione peroxidase, catalase, and superoxide dismutase) are prevented from peroxidative damage (Kalaiselvi and Panneerselvam 1998). Rhizopus oligosporus (R. oligosporus) is a dominant fungus in special fermented soybean products like Indonesia teampeh. During the fermentation by R. oligosporus, the macromolecules were hydrolyzed by enzymes and coupled with the metabolism of the corresponding hydrolytic products to changes in the biochemical composition of food substrates (deReu et al. 1997; Handoyo and Morita 2006). Fermented soybean with R. oligosporus showed increase amounts of γ-aminobutyric acid (GABA), one of main fermented products from synthesizing from glutamate by glutamate decarboxylase (Dhakal et al. 2012; Handoyo and Morita 2006). In our previous study, R. oligosporus was used to produce l-carnitine and GABA in buckwheat by fermentation with no additional nutrients, and feed for chickens to gain high l-carnitine content in eggs (Park et al. 2016). The quinoa fermentation by using R. oligosporus have been reported (Matsuo 2005, 2006). However, these studies only focus on antioxidant activity of fermented quinoa. And there was no report for the improvement of l-carnitine and GABA in fermented quinoa as well as its biological and biochemical studies. In this regard, we fermented quinoa with R. oligosporus DK1 to improve the quality of the food regarding the enhancement of l-carnitine, GABA, phenolic acid compounds, antioxidant and anti-inflammatory effects. White quinoa was selected for this study because it contains more antioxidative compounds than those of red and black quinoa (Masayo and Watanabe 2010). Rhizopus microspores var. oligosporus was obtained from our previous study (Park et al. 2016) and deposited as KCCM 11948P (Korean Culture Center of Microorganisms, Seoul, Korea). It was maintained on Potato Dextrose Agar (PDA, Difco, USA) plates. Rhizopus oligosporus was cultured on PDA medium at 30 °C for 3 days to prepare spores (Park et al. 2016). White quinoa was purchased from KtFood (Seoul, Korea). 150 g quinoa was soaked in 150 mL water for 12 h and steamed for 20 min at 121 °C. Fermentation was conducted by inoculating 1 × 104 spores/g steamed quinoa at 30 °C for 3–5 days. Fermented quinoa was lyophilized at − 10 to 0 °C under 20 Pa (Tokyo Rikakikai Co., Tokyo, Japan) for further study. Quinoa surfaces of sample prepared before and after fermentation were observed using a scanning electron microscope (SEM, TM 3030plus, Hitachi, Tokyo, Japan). Whole grain images were taken at magnification of ×100, 5.0 kV of accelerate voltage in secondary electron (SE) mode. At magnification ×1.0 k, fungi hypha was removed and observed at 15 kV of accelerate voltage in SE mode. LC/MS analysis was conducted by using the method as our previously described (Park et al. 2016). Samples were dissolved in water for analysis of l-carnitine or GABA. Samples were diluted with acetonitrile for l-carnitine and GABA, and all filtered using a 0.2 µm membrane (Sartorius AG, Gottingen, Germany). A 1 µL sample was injected into the LC/MS system (Waters, Milford, MA, USA); Waters Acquity H-Class system with Waters QDa detector, Waters Acquity UPLC BEH HILIC 1.7 µm, 2.1 mm × 100 mm column. Solvent A was 15 mM ammonium formate with 0.1% formic acid in distilled water and solvent B was 0.1% formic acid in acetonitrile. The temperature of column was maintained at 40 °C. The following elution gradient was applied for l-carnitine and GABA analyses; 0–3 min, 10% A; 3.1–5 min, 10–30% A; 5.1–6 min, 30–60% A; then a 4 min for equilibrium step. Electrospray ionization (ESI) was conducted with a positive with selective ion recording (SIR) (m/z 162 for l-carnitine and m/z 104 for GABA). Capillary energies were 1.5 kV. Cone voltage was 10 V for l-carnitine and 5 V for GABA. Acetonitrile (90%, v/v) was used as a blank. Calibration curves were prepared using the external standard method with l-carnitine concentrations ranged from 0.01 to 1 µg/mL, GABA ranged from 0.1 to 10 µg/mL. Linearity between concentrations of standards vs area was evaluated (r2 > 0.99). LC/MS analysis was conducted by using the method as previously described (Park et al. 2016). Samples were dissolved in DMSO for vanillic acid, chlorogenic acid, or gallic acid as 10 mg/mL. Samples were diluted with methanol for phenolic acids, and all filtered using a 0.2 µm membrane. A 1 µL sample was injected into the LC/MS system. Solvent A was distilled with water and solvent B was acetonitrile with 1 mL formic acid/L. The temperature of column was maintained at 40 °C. The following elution gradient was applied for phenolic acids analyses; 0–0.5 min, 95% A; 0.5–3 min, 95–70% A; 3–5 min, 70–0% A; 5–6 min, 0% A; then a 4 min for equilibrium step. ESI was conducted with a negative with SIR (m/z 169 for gallic acid, m/z 353 for chlorogenic acid, and m/z 167 for vanillic acid). Capillary energy was 0.8 kV for phenolic acids. Cone voltage was 10 V for phenolic acids and methanol was used as a blank. Calibration curves were prepared using the external standard method with phenolic acids concentration ranged from 0.1 to 10 µg/mL. Linearity between concentrations of standards vs area was evaluated (r2 > 0.99). The total phenolic contents were determined by Folin ciocalteu’s method (Masayo and Watanabe 2010) with gallic acid as the standard (Sigma). 10 mg quinoa or fermented quinoa extracted powder was dissolved in 1 mL water. Each 120 µL of sample or gallic acid (0–50 µg/mL) was added into 96 wells plate and 15 µL of Folin ciocalteu’s reagent (Sigma) was mixed together for 3 min in dark condition. Then, 15 µL of 10% (w/v) Na2CO3 was added and reacted for 30 min in dark condition. The TPC were determined by spectrophotometry at 750 nm (SpectraMax M3, Molecular Devices, USA) and presented as gallic acid equivalent (GAE). TFC was determined by aluminum chloride colorimetric method (Chang et al. 2002) with quercetin as the standard (Sigma). 20 mg quinoa or fermented quinoa extracted powder was dissolved in 1 mL DMSO, and then fivefolds diluted in methanol to give final concentration as 1 mg/mL and volume of 2 mL. Each sample or quercetin (0–15 µg/mL) was mixed with 100 μL of 10% (w/v) AlCl3 and 100 μL of 0.1 mM CH3CO2K. TFC was determined by spectrophotometry at 415 nm using SpectraMax M3 and presented as quercetin equivalent (QE). A linear regression curve was established to determine the amount of sample necessary to decrease 50% of the absorbance of DPPH (SC50 value). All analyses were conducted in duplicate. Results were expressed as mean ± standard error (SEM). RAW264.7 mouse macrophage cell line was purchased from Korean Cell Line Bank (Seoul, Korea) and cultured in Dulbecco’s modified Eagle’s medium (DMEM, Gendepot, USA) supplemented with 10% (v/v) fetal bovine serum (FBS, Gendepot, USA), 100 U/mL penicillin and 100 µg/mL streptomycin (Invitrogen, USA) at 37 °C in 5% CO2 (Choi et al. 2018b; Maxwell et al. 2017). RAW264.7 macrophage cell was seeded on 96 wells plate at 2 × 104 cells/well and cultured for 48 h. Cells were rinsed with phosphate-buffered saline (PBS) and then treated with quinoa or fermented quinoa extract in DMEM medium without Fetal bovine serum (FBS) ranging from 1.56 to 1600 µg/mL obtained by diluting quinoa or fermented quinoa extract with the culture medium. RAW 246.7 cells cultured in a medium without adding samples were used as controls. After 24 h at 37 °C, 90 µL of medium was mixed with 10 µL of Ez-CyTox solution (Daeil Lab Service, Seoul, Korea) and then incubated at 37 °C for 1 h. Absorbance was measured at 450 nm using SpectraMax M3. Percent viability was calculated as cell viability relative to the control. Nitric oxide production was determined as previously described method (Kim et al. 1999). RAW 264.7 cells were seeded to 96 wells plate at 2 × 104 cells/well and cultured at 37 °C for 48 h. The sample treated with 1 µg LPS/mL and 100 µM indomethacin was used as positive control. Cells were then treated with quinoa or fermented quinoa extract in DMSO ranging from 12.5 to 50 µg/mL without effects on cytotoxicity under testing, and cultured at 37 °C for 24 h. Then, 80 μL of culture supernatant was mixed with 80 µL of Griess reagent containing 1% (w/v) sulfanilamide in 5% (v/v) phosphoric acid, and 0.1% (w/v) naphthylethylenediamine, for 20 min, and absorbance was measured at 540 nm using SpectraMax M3. The amount of nitrite in the sample was evaluated from a standard curve generated with a sodium nitrite standard curve (0–500 µM in cell culture medium). Experimental results were statistically analyzed by t-test (IBM SPSS Statistics 22, IBM, USA). Values are presented as mean ± standard error of the mean (SEM). Significant differences between the groups were evaluated and indicated by different lower-case letters (p < 0.05 and p < 0.01). The general quinoa and degradation of quinoa after fermentation were observed by the SEM. Figure 1 shows the surface of general and fermented quinoa. General quinoa (Fig. 1a) was observed with smooth surface. Fermented quinoa (Fig. 1b, c) was covered by R. oligosporus and mycelium was observed on fermented quinoa. The washed off fermented quinoa (Fig. 1e, f) revealed surface degradation comparable to the general quinoa (Fig. 1d), and exposed starch granule. The extraction yields of NF, 3F, and 5F were 23.4%, 45.9%, and 39.1%, respectively. Among them, 3 days fermented quinoa showed highest extraction yield. The l-carnitine content was enhanced from 0.13 mg/kg to 3.15 and 1.54 mg/kg of quinoa extracts at 3F and 5F, respectively (Table 1). GABA was produced by the R. oligosporus fermentation, from 540 mg/kg to 1040 and 810 mg/kg of quinoa extracts at 3F and 5F, respectively (Table 1). Concentration of vanillic acids was increased during fermentation as 1.3, 1.55, and 1.83 mg/kg in NF, 3F, and 5F extracts, respectively (Table 1). Concentration of gallic acid was 0.01, 2.37, and 0.84 mg/kg in NF, 3F, and 5F extracts, respectively (Table 1). Chlorogenic acid was found 0.002 mg/kg for NF and 5F, but 0.03 mg/kg was detected at 3F extract (Table 1). Antioxidant activity was mainly investigated based on analysis of TPC, TFC, or DPPH radical-scavenging activity of each sample. After fermentation, TPC was increased from 41 mg GAE/kg to 74 and 80 mg GAE/kg of quinoa extracts at 3F and 5F, respectively (Table 2). TFC was increased from 13 mg QE/kg to 16 and 19 mg QE/kg of quinoa extract at 3F and 5F, respectively (Table 2). Antioxidant activity (SC50) of quinoa extracts prepared with NF, 3F, and 5F were 3.6, 3.4, and 2.3 mg/mL, respectively (Table 2, Additional file 1: Figure S1). Cell viabilities of RAW 264.7, macrophages cells, are shown in Fig. 2a. Cell viabilities were reached at 100% at the concentration of 100 µg/mL so that the nitric oxide assay was conducted from 50, 25, and 12.5 µg/mL (Fig. 2a). Production of nitric oxide was investigated by lipopolysaccharides (LPS) stimulation. At the concentration of 50 μg/mL, the 5F extracts had significantly high anti-inflammatory activities. Production of nitric oxide was decreased 22.8, 19,7 and 14.0 µM in NF, 3F, and 5F extracts, respectively (Fig. 2b). These patterns were also shown at 25 μg/mL as 27.4, 24.5 and 23.6 µM of nitric oxide production in NF, 3F, and 5F extracts, respectively. As for 12.5 μg/mL, the nitric oxide was produced 30.8, 28.0 and 29.8 µM at NF, 3F, and 5F extracts, respectively. Since nitric oxide production is generated from inflammation, fermented quinoa had therapeutic abilities by reducing nitric oxide production. Traditionally, quinoa has been cooked in salads, soups, porridges, and stews. Quinoa are found in forms of flakes, grains, and flours and have increasingly become incorporated into products such as noodles and energy bars. Recent developments of quinoa flour in small-scale products include bread, muffins, pasta, snacks, drinks, flakes, baby foods, beer and extrudates (Diaz et al. 2013; Matsuo 2006). In order to improve the functionalities, nutrition values and taste of quinoa, we fermented quinoa grains using R. oligosporus. 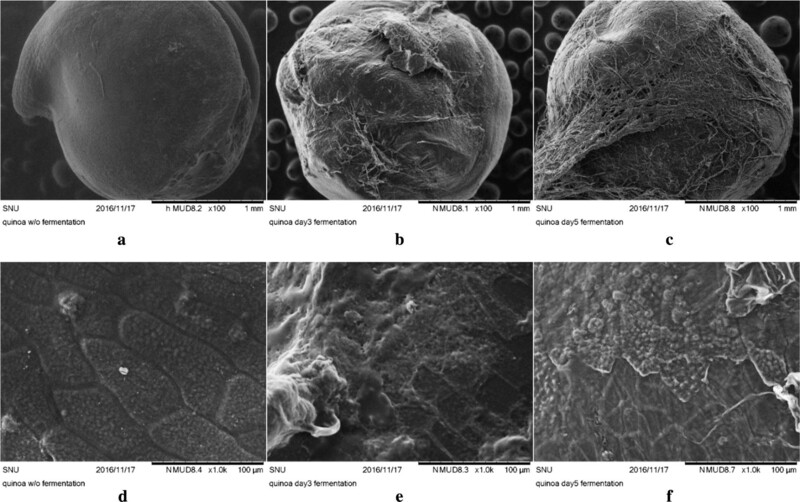 Morphological characteristics by using the SEM reveals degradation of quinoa by R. oligosporus enzymes after fermentation (Fig. 1a–c). Raw quinoa seeds had polygonal granules (0.6–2.0 µm diameter) present singly and as spherical aggregates (Ruales and Nair 1993). After fermentation, the polygonal granule was hardly observed and degraded into low-molecule-substances that brought different biological values to fermented quinoa (Fig. 1b, c). Degradation of cell structures of fermented quinoa was due to lipases, amylases, protease, and glucoamylase that produced from R. oligosporus (Handoyo and Morita 2006; Jin et al. 1999). The 3F and 5F quinoa extracts had higher content of l-carnitine (24.1 and 11.8 times) than non-fermented quinoa. Handoyo and Morita (2006) reported that R. oligosporus hydrolyzed protein into amino acids and small peptides. In other study, Matsuo (2006) reported that the amount of lysine was increased from non-detection to 0.31 g/kg dry quinoa and lysine from 0.11 to 0.51 g/kg dry quinoa during R. oligosporus fermentation. l-carnitine is synthesized from lysine and methionine thus the synthesis of l-carnitine depends on the amount of lysine and methionine in quinoa. The GABA contents in fermented quinoa showed 1.9 and 1.5 times higher than that of NF. GABA is synthesized from glutamate catalyzing by glutamate decarboxylase while quinoa contained high glutamate (0.71 g/kg dry quinoa) (Matsuo 2006). Fermented quinoa extract revealed 36.1% enhanced anti-oxidative activity in DPPH-radical scavenging activity level. This result was agreed with previous reported by Mastuo (2006). The enhancement of antioxidant activities probably resulted in the increased amounts of phenolic compounds by the fermentation. Contents of phenolic acids such as vanillic acids, gallic acids, chlorogenic acids, and TPC, TFC were also changed and possibly effected to improvement of DPPH-radical scavenging activity. Vanillic acid was known for main phenolic acids in quinoa, and other phenolic acids were also analyzed such as gallic acids and chlorogenic acids. Vanillic acids contents were increased by fermentation as 1.3–1.83 mg/kg by NF and 5F, respectively. In case of gallic acids were increased at 3F by 2.37 mg/kg from 0.01 mg/kg of NF, but decreased at 5F by 0.84 mg/kg compared to 3F. As for chlorogenic acid, the pattern was similarly revealed as gallic acids for increased amount at 3F by 0.03 mg/kg from 0.02 mg/kg of NF, and decreased at 5F as 0.02 mg/kg from 3F. It is probable that phenolic acids are derivatives for other phenolic acids (Rice-Evans et al. 1996). In this study, TPC (Table 2) were enhanced (1.8 and 2.0 times increase at 3F and 5F) during the R. oligosporus fermentation and were probably obtained from formation of higher contents of phenolic compounds such as vanillic acids, gallic acids and chlorogenic acids. McCue and Shetty (2003) reported that α-amylase and endogenous carbohydrate-cleaving enzymes activities had a role to generate polyphenols from carbohydrates-conjugated phenolic compounds. R. oligosporus is a known strain to produce β-glucosidase, β-glucuronidase and xylanase when degrade the cell wall matrix (Huynh et al. 2014). Thus, it was probably metabolized with the bioconversion of phenolic compounds by the fermentation leads the cell-wall degrading enzymes to hydrolysis of glycosidic bonds and produces bound phenolics and aglycone forms (Huynh et al. 2014). Also, TFC (Table 2) were enhanced by 1.2 and 1.5 times increase at 3F and 5F. The fermentation processes releasing phenolic compounds from plant matrixes followed by the metabolic pathways of flavonoids: glycosylation, deglycosylation, ring cleavage, methylation, glucuronidation, and sulfate conjunction which are way of producing new bioactive compounds (Huynh et al. 2014). These increases in phenolic compounds effected to the enhancement of antioxidative activity (Kaur and Kapoor 2002). Increase of flavonoids contents has also influenced on DPPH-radical scavenging activity resulting in higher antioxidant activity of fermented quinoa extracts than non-fermented ones. Since antioxidant properties of fermented quinoa extracts were found, anti-inflammatory effect on mammalian cells was further investigated. Anti-inflammatory function of fermented quinoa extract was studied on RAW 264.7, macrophages, with LPS-stimulation. Nitric oxide production was inhibited 29.3% for NF, 38.9 for 3F and 56.4% for 5F, resulting in improvement of 192.6% in anti-inflammatory activity (Fig. 2b). Kim et al. (1999) reported that the flavonoids inhibit NO production in lipopolysaccharide-activated RAW264.7 cells and reduce of iNOS enzyme expression. Thus, the increase anti-inflammatory effect of fermented quinoa compared to the regular quinoa due to increasing of total phenol and total flavonoids contents in fermented quinoa by R. oligosporus. Biscuits made by substituting 20% of the flour with R. oligosporus fermented quinoa powder increased its iron and α-tocopherol contents by a factor more than 2.5 and scored high in sensory analysis of flavor hardness and taste in soft biscuits (Matsuo 2006). The absorption of iron from R. oligosporus fermented quinoa was higher than that of quinoa powder in rats for partial digestion of phosphoric compounds (Matsuo 2006). Therefore, the increased concentration of l-carnitine and GABA in fermented quinoa by R. oligosporus could be improved by the beneficial functionalities and nutritional values in fermented quinoa supplemented food materials. In conclusion, fermented quinoa extract has effective antioxidant and anti-inflammatory activities. These activities may be due to presence of phenolic compounds, flavonoids and the other products produced during fermentation by R. oligosporus. Although the 3rd day fermentation revealed optimal conditions to produce l-carnitine and GABA, the 5-day fermented quinoa extract had higher TPC, TFC, antioxidant activity and improved reduction in inflammation than regular quinoa extract. In this regard, fermented quinoa can be used as a healthy and valuable food product. DK designed and coordinated the study. JH performed fermentation and morphological characterization. NP and JK performed preparation of extracts and component analyses. TN carried out antioxidant assay and cell test. JH and TN drafted manuscript. All authors read and approved the final manuscript. All data generated or analyzed during this study are included in this manuscript and Additional material. This work was partially supported by the Basic Science Research Program through the National Research Foundation of Korea (NRF) funded by the Ministry of Education (NRF-2015R1D1A1A01056929; D. Kim, and 2018R1D1A1B07049569; T.T. Hanh Nguyen), by Korea Institute of Planning and Evaluation for Technology in Food, Agriculture, Forestry (IPET) through Agriculture, Food and Rural Affairs Research Center Support Program, funded by Ministry of Agriculture, Food and Rural Affairs (MAFRA) (710012031HD220), and under the framework of International Cooperation Program managed by the NRF (2016K1A3A1A19945059), and OTTOGI Corporation through Research and Publication Project. 13568_2018_675_MOESM1_ESM.docx Additional file 1: Fig. S1. DPPH radical scavenging of nonfermented quinoa (NF), 3-day fermented quinoa (3F), 5-day fermented quinoa (5F).